There is so much to consider when putting your house on the market. Coming up to speed on the latest paint trends, getting your house decluttered and staged for professional photography so it is not surprising to forget some of the “to do”s on your task list. Smoke and monoxide alarms are a very important task and should not be left to last minute during a transaction, in fact as soon you are thinking of selling, it is something you can bring up to code if not already. Follow this step by step guide on one-two family homes below to learn more. For better viewing, click on the chart above. 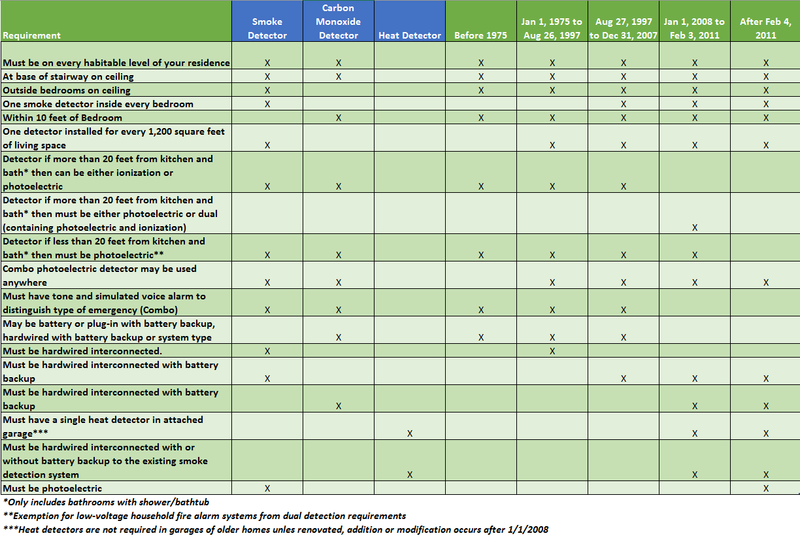 To get started, find the year in which your home was built in the top row and review the combination of your green column (year built) and the blue columns (detectors) to see which requirements to the left should be applied to your home. Before running out to buy smoke and carbon monoxide detectors. Go through your house and take an inventory of what you have and check off that the following requirements above are true and make note if an alarm is missing. Be sure to find the year your house was built to determine which requirements apply to your home. If your smoke detectors are more than 10 years old, then you are going to need to replace them. You can usually find this on the back of the detector by looking for the manufacturing date. If no date exists, then it is most likely out of date. Once you have collected your inventory, make sure that each of your smoke and carbon monoxide detectors meets the requirements of location, type and age in steps 1-3 above. For any detectors that do not meet location requirements move them, for any smoke detectors over 10 years old replace them and for any missing detectors, shop for new ones. Once all the updates have been installed in your home, call your local fire department to schedule your home inspection. At this time if all your detectors meet code, you’ll receive a Certificate of Compliance. You will need to retain this certificate for closing when you transfer your house to the new homeowner. Hope this helps to make your next sell go smoothly!